Where in the World is Christy Romer? | This is Ashok. Where in the World is Christy Romer? This is, inadvertently, a Rorschach test. You should be – regardless of your persuasions – squirming that Christina Romer is excluded from this little elite list of potential chiefs of the world’s most important bank. You should wonder when competence and “Obama connection” are the factors of inclusion why the only administration don to actually get everything right is excluded from the list. The list is constituted of very respectable names. Janet Yellen knows that that the Fed has a dual-mandate. Larry Summers has shown a growing desire to reform mainstream economics. We can be sure he’d consider fresh ideas like a nominal output target. Jeremy Stein provides one of the only coherent arguments against easy money. (I don’t agree with him, I think market expectations of a heating economy would take care of any insanely-risky behavior, but he’s about as brilliant a chance the monetary hawks have – and he probably does not even agree with them). Stan Fischer seems to have done wonders in Israel. Because it directly reflects the Fed’s two central concerns — price stability and real economic performance — nominal G.D.P. is a simple and sensible target for long after the economy recovers. This is very different from Mr. Volcker’s money target, which was abandoned after only a few years because of instability in the relationship between money growth and the Fed’s ultimate objectives. Desperate times call for bold measures. Paul Volcker understood this in 1979. Franklin D. Roosevelt understood it in 1933. 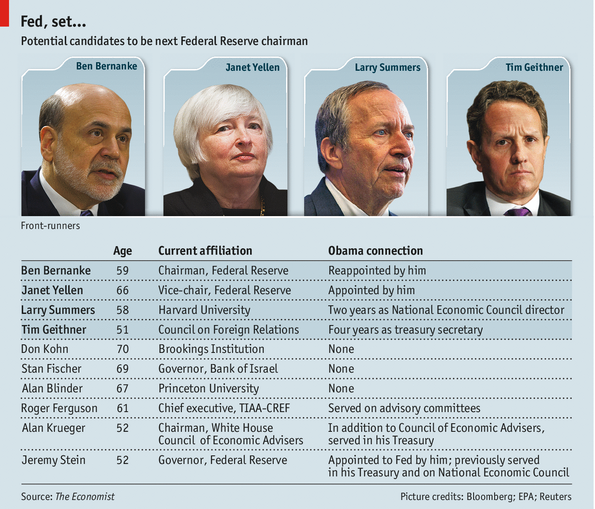 This is Ben Bernanke’s moment. He needs to seize it. Infamous memos to Larry Summers during the depths of the Lesser Depression, as Brad DeLong now calls it, prove that Romer had a brilliant grip on America’s fiscal woes (read: she’s a Keynesian). That she acknowledges that the Fed has a dual-mandate (remember when Bernanke bragged about his fantastic inflation record) and is open to new thinking suggest she’s equally competent (that is to say, mind-blowingly brilliant) on monetary issues. Most of the candidates the Economist outlined deserve to be on that list, but it looses its value without Christina Romer.